This is a hotly debated issue; was there an actual historic Great Flood or is Noah's story just a myth taken from other cultures? To address this question we will look at the ancient flood stories of different ancient cultures, and discuss evidences in geology and fossil records. This topic requires and open mind but also requires a spiritually open mindedness. The Great Flood is dated before 3,000BC. Noah is a historical and actual person of history who lived through an actual historical event according to the author of 1 Chronicles 1:4, prophet Isaiah (Isaiah 54:9), prophet Ezekiel (Ezekiel 14:14, 20), apostle Peter (1 Peter 3:20; 2 Peter 2:5), the author of Hebrews (Heb 11:7), Luke (Luke 3:36), and Jesus himself (Matt 24:37-38; Luke 17:26-27). To say that Noah and the Flood is a myth is to call all these people either liars or the authorship of the words a lie. Without using the bible (even though secular scholars agree the historical reliability of the bible) what other evidences can we find that validate the historical person of Noah and the Flood event? If one family survived the flood, then all other families after them would have been taught about it. If all the different ancient cultures of the world came from the one family that survived the flood, they would have passed down the story (Gen 9:1). Noah lived 350 years after the flood and was the last person of the pre-flood generation to live that long. For the next 350 years Noah was able to teach all his decedents the stories of the Flood. So where did the confusion of the details of the event come from? Noah in his ignorance discovers that wine can get you drunk. His sons see this and its effects; it causes a whole ordeal, and thus, sin continues in the hearts of humanity after the flood (Gen 9:18-27). From there, the genealogies of Noah's decedents begin to reveal the diversity in culture as time went on (Gen 10:1-21). Sumeria was the first most visible centralized culture and people group in history which, according to the bible, come from Noah's son Shem (Gen 10:21-22). Noah's son Ham was the father of Cush who was the father of Nimrod (Gen 10:6-11); whom founded Babylon, traveled through Assyria and founded Ninivah. It is clear that the oral story of a world wide flood could have been passed down, but given the continued sin of mankind, the distortion and confusion of the story is clear. The Sumerian King List is huge. Earliest sources of this list dates to around 1,000BC. There are a couple critical details about the list. (1) It states that the authority of the kingship came from heaven. (2) The life spans of the early kings were very long. (3) A flood wiped out the kingship and it had to be re-established after the flood. (4) after the flood, the kings life spans were greatly reduced. 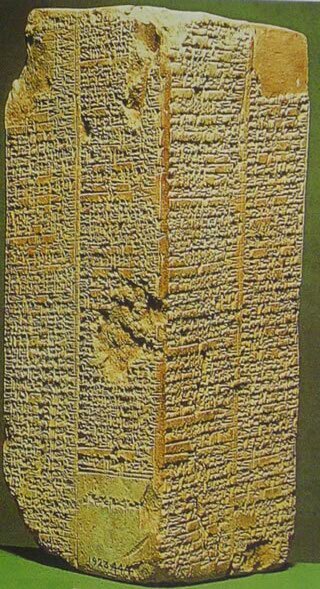 The earliest historically verified king on the list is around 2,600BC and the king after is in the Epic of Gilgamesh. But the list goes even farther back to more than 4,000BC. It is important to state that this list was meant as a historical list and not a fictional story. It was the Sumerians attempt at recording their history. Where did Sumerian's get the flood idea from? Knowing that the bible is historically reliable, we then see the Sumerian people descending from the sons of Noah. Thus, the flood story would have been passed down from Noah and his sons and their sons. That is how they could have knowledge of people who per-existed before the flood, and after the flood; also have knowledge about the longer life spans prior to the flood just, as the bible describes. Why couldn't have the bible got the idea from the Sumerians? The Bible describes pre-flood and post-flood in ways that only those whom had experienced it could have described or from one whom and received the details first hand. Given the better reliability of The Bible compared to the Epic of Gilgamesh and other more ancient documents, we can see that the bible is a better source. The Bible also helps explain, if there was a flood that took out the world, how future people were even aware of pre-flood and past individuals. If the Sumerian story preceded the bible, how was the bible better, more reliably informed, and able to explain more accurate details? The Eridu Genesis (Sumerian Creation story) came about later. One single fragment of the story was discovered that dated to about 1,600BC. It describes a distorted and corrupted view of The Great Flood. There are continued key similarities to The Great Flood account of the oral traditional story from Noah. (1) a priest learns of an impending flood sent from heaven (2) and is instructed to build a large boat (3) animals were loaded in the boat (4) and the priest performs scarifies to a deity. (5) they exit the boat and the deity gives the priest eternal life and preserves the animals and mankind. By the time of this record of the flood, it had been over 2,000 plus years since sons of Noah; allowing for a loss of traditional Noah heritage and a change in details of the oral story. 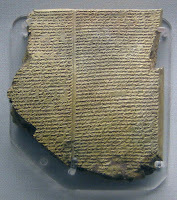 The Epic of Gilgamesh. The discovery of Table XI of the story was carved around 700BC. On the Tablet it states very similar details about the flood theme. (1) Deity reveals plan to flood mankind, (2) instructed to build a boat in preparation for the flood (3) A great and violent flood (4) After the storm, a sacrifice to a deity was performed (5) eternal life was given. Until recently, the Epic of Gilgamesh was only seen as a fictional story but discoveries related to mentioned kings in the story has lead to some historical features of the story. Artifacts related to Aga and Enmebaragesi of Kish have shown them to be actual people of history. In ancient greek history, there are stories of a flood that also contains similarities to The Great Flood. Plato even states that an world wide flood was an actual historical event in Plato's Critias. The Greek flood stories are however more mythological than the ones that proceeded them. Even in ancient China, we see all the regions ancient dynasties end or change together probably due to reconstruction and recolonization after the flood, around mid 3rd millennia BC. Something forced China's ancient people groups from Neolithic age and transition into the Xia dynasties. The Yellow Emperor, legend or a true historical person, even includes a story about a massive flood all throughout China. His supposed reign was around the late 2nd millennia BC. Given that these people groups were separate and isolated from other cultures closer to the Noah's semi continued secularized traditions; their stories would be more different. This is reflected in the Yellow Emperor's tale of a great flood as it was vastly different. In just about every major civilization since the Sumerian story has had some sort later version of the flood story. The African culture of The Maasai have a similar great flood story with the same themes. In India, in the Shatapatha Brahmana which was recorded not too long after the Babylonian story also contains the same key themes of The Great Flood. The people group of Malaysia, known as the Temuan, have a very similar flood story despite their isolation from middle eastern cultures. Even Mesoamerica and Hopi stories of their ancestors maintain a story of a great flood caused due to mankind angering a deity. Why the different accounts if it was the same event? After the flood, Noah, his sons, and their families began to spread out around the world. The different family groups moving to different geographical locations over time would develop their own unique traditions and stories; eventually into their own distinct culture group and nation. How accurate is Google Translate? To some, it is helpful, to others it does not use the correct words and does not get across the most accurate translation of what is being stated. Imagine all people generally speaking the same language, then a few generations later, speaking a completely different language. How easy would it then be to communicate past stories accurately? The story of The Tower of Babel explains just that. The different people groups, descendants from the sons of Noah, were lead to create their own unique languages. This would have also contributed to the confusion and distortion of the account of The Great Flood between the different cultures. 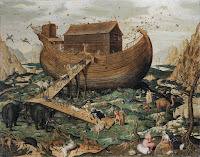 As the people groups lost their connection to the traditions of Noah, they continued to pass down their own versions of the event and embellish them to fit their own situations and culture. Did Moses get the flood story from Sumerian and Babylonian myths? The answer to this question greatly depends on your faith. Is God able to reveal historic truths to those whom he ordained to record them? Is God then able to influence the writers to accurately record what he reveals to them? If the answer is "no" or "maybe" to those questions, than for you, finding God will be very difficult; and finding the biblical account of The Great Flood just as difficult. More specifically, the question is: Is God able to reveal prehistoric truths to Moses, and influence him to accurately record them? This is a critical and deep spiritual question that everyone will be confronted with when pondering the flood story. If someone is atheist or agnostic, their obvious answer would be "no" because of their anti-spiritual bias. For God to be God, he must be able to this; or he is not really God and the whole bible is irrelevant. This is where it depends on your faith or lack of. The answer is, God can and did reveal prehistoric truths to Moses; God can and did influence the one who He chose (Moses) to accurately record what He revealed. Because Jesus is God, and Jesus validated Noah and the flood as an actual historic person and event, it must be true- or Jesus is not God. THEREFORE Moses recorded exactly what God revealed to him about the historic event; and all the other stories of the same historic event came from corrupted descriptions stemming from Noah's son's families and their generations of decedents. In fact, the correct true explanation of the event may have been already orally passed down within the people group that kept the traditions of Noah and finally recorded by Moses. To assume and jump to the concision that Moses stole or borrowed from the Sumerian or Babylonian myths, or parts of the Egyptian great flood myths, only reveal anti-spiritual bias in the assumed conclusion without considering the faith aspect. Because IF God IS able, why could he not have? What Evidence is there for a world wide flood? Marine fossils found on mountains: How did marine fossils end up in the middle of continents miles above sea level? For example, there are marine fossils found in layers of the Grand Canyon, 1 mile above sea level . Shellfish fossils found in the Himalayan mountains of Napel . How did ancient sea life climb a mountain? Mass plant and animal death and fossil groupings: Chambered nautiloids' are found in the Grand Canyon along with millions of other sea creatures burred in the same layer spanning 10,500 square miles. Hundreds of thousands of marine creatures were buried with amphibians, spiders, scorpions, millipedes, insects, and reptiles in a fossil graveyard at Montceau-les-Mines, France . More than 100,000 fossil specimens, representing more than 400 species, have been recovered from a shale layer associated with coal beds in the Mazon Creek area near Chicago . This spectacular fossil graveyard includes ferns, insects, scorpions, and tetrapods buried with jellyfish, mollusks, crustaceans, and fish, often with soft parts exquisitely preserved. There are locations around the world were not only are there mass death and burial of creatures, but these creatures are both land and sea creatures, buried together. Also in Florissant, Colorado  and Green River Formation of Wyoming . Sediment layers are spread over vast areas world wide: The famous Cretaceous chalk beds of southern England that form the white straight cliffs is the same Cretaceous chalk with the same fossils and the same distinctive strata above and below them are also found in the Midwest USA, from Nebraska in the north to Texas in the south. They also appear in the Perth Basin of Western Australia. The Cretaceous Chalk sediment layer was spread all over the world at the same time to achieve the same layer and fossils. Wind and gradual erosion could not produce this, in this vastness all around the globe in the same time frame. Where are Pre-Flood Human fossils? This takes an unbiased approach to address this question, and is ignorantly used as a 'gotcha' question. Do humans commonly get buried with Elephants or Tigers in modern times? No. The percentage of dinosaur fossils found, out of all fossils found, is 0.01%; what are the odds we will find a human fossil when there was a smaller amount around the same time? That would be more exceedingly rare than finding dinosaur fossils, and finding dinosaur fossils is rare already . Also, dinosaurs were more spread out, and according to Gen 4:17 we see people already lived close together instead of spread out. Secondly, God made it absolutely clear he was going to "blot out" mankind from the face of the earth in Gen 6:7 and Gen 7:23. That is an absolute destruction. Do you think it will be easy or possible to find something that God has "blot out" from the earth? If anything, the fact we have not found a single human fossil from that time period only validates what the Bible said God would do. The 2004 tsunami in Southeast Asia was a known localized event that happened only 12 years ago and still 43,000 victims were never found . Now think of how difficult it would be to find 150,000 to 250,000 prehistoric people who were swept away by a world wide flood covering the face of the earth over 5,000 years ago. Biased people expect to find pre-flood human fossils from over 5,000 years ago searching for unknown locations world wide, to be convinced; yet, in our modern times we can't find 1/3 amount of people in a known localized event that happened only 12 years ago. Before dinosaur fossils were discovered, did that mean they did not exist? Has humanity discovered everything there is to discover? Does that mean, what we have not discovered, does not exist? Apply the same logical conclusion to the issue above. The Great Flood is an actual prehistoric event. From the bible, the event of the Great Flood is supported by its divinely inspired authors and Jesus himself. Outside of the bible, it is a historical event according to The Sumerian Kings List and the recently semi-historical validated Epic of Gilgamesh. Different cultures from around the world, separated and isolated, still have some sort of story that contains similar key elements. The fossil record and sediment layers are also explained by a great world wide flood. Given the evidences, it is true that there was a world wide flood. Noah was instructed to build a large vessel by God. He did and a world wide flood came. He and his family survived with vegetation seeds and animals. They then repopulated the earth. Their decedents spread throughout the world and their decedents continued the Great Flood story but lost the source (true oral traditions from Noah). They injected their own messages and details to fit their own culture. The oral traditions from Noah was then recorded by Moses, guided by God as it was revealed by God to Moses. We can be confident today that we have the true recorded oral traditions of the events of creation and the flood in the Bible; and that it was revealed by God, and securely recorded with God through Moses. With the spiritual truth aspect of the flood; Noah's Flood in the Bible explains what is observed in history, archeology, and geology. Without the truth in the spiritual context of faith in God's security and divine revelations to Moses; all the stories and fossils are just unexplained, oddly convenient, confused, and oddly consistent myths. S. S. Beus, “Redwall Limestone and Surprise Canyon Formation,” in Grand Canyon Geology, 2nd ed., eds. S. S. Beus and M. Morales (New York: Oxford University Press, 2003), pp. 115–135. J. P. Davidson, W. E. Reed, and P. M. Davis, “The Rise and Fall of Mountain Ranges,” in Exploring Earth: An Introduction to Physical Geology (Upper Saddle River, New Jersey: Prentice Hall, 1997), pp. 242–247. A. Snelling, Where are all the human fossils? Creation 14(1):28–33, December, 1991; J. Morris, The Young Earth, Master Books, Green Forest, Arkansas, 2002, 71.